I have a great little cookie recipe for you today. I know it’s dismal old, diet happy January. The sun here in Salt Lake City has been missing in action for weeks now. I happened to be driving home from a family funeral in Southern Utah a few days ago….and good gracious! The yucky inversion around this city of Salt Lake is down right hideous! …and gaze at a blue sky. Spending time with my extended family wasn’t half bad either. Alright, I’ll admit…it was down right fabulous. It was pretty much the funniest funeral I have ever attended. And, I mean no disrespect. But, my relatives down south are side busting funny, I tell you. To my relatives down south I say, I love ya!!!!! It was great to be with you. These buttery-cinnamon sugary-chewy cookies are really to die for. this very day, if it suits your fancy. I dare say they are one of the best cookies I have ever made. 1. Cream the butter and sugar until light and fluffy, about 3 minutes folks. Add the eggs and cream for about 2 minutes more. This is a really important step. Creaming the dough at this point will give you soft chewy cookies later on in the game. 2. In a separate bowl combine the flour, cream of tartar, baking soda, baking powder, and salt. Add it to your creamed mixture. Mix until all ingredients are combined. 3. 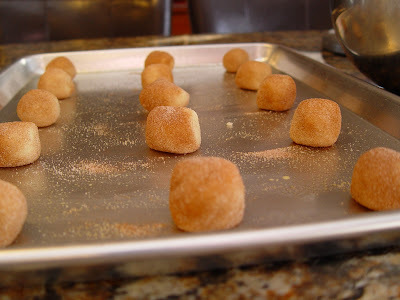 In a small bowl mix together the cinnamon sugar coating. Roll the dough into balls and roll it around in the coating. 4. Place the cookies on a cookie sheet sprayed with cooking spray. Don’t set them too close to each other. You want them to have room to spread out and not have to touch each other while they bake. 5. Bake at 375 for 8 minutes. You only want to bake them until the outsides crack. Then take them out and let them finish cooking on the hot cookie sheet. Enjoy! I found your blog button at another blog and am checking you out. =) I LOVE snickerdoodles! I adore how you wrap a ribbon around them. Sounds like quite a memorable funeral huh? I imagine that's just how the deceased would have preferred it. Have a great day – stay warm in the kitchen. Mmmm I love snickerdoodles. Can't wait to make these. I am always up for Snickerdoodles! 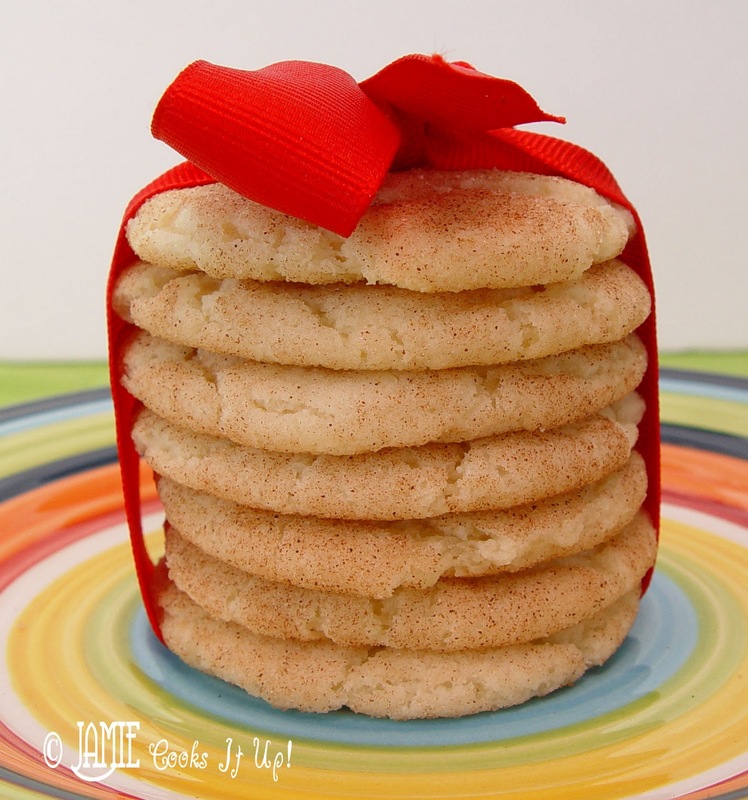 You have no idea how much love I have for snickerdoodle cookies….Have I found a recipe yet that satisfies me?? NO!! I am going to try yours if you don't mind. Hey Jamie, How far south were you? There's been lots here, Heres a fun tip: Pan parchment paper! saves alot of grief when it comes to doing cookies, cinnamon rolls, bread sticks, etc. you name it, Alison's pantry has them for $6.99 per hundred, soo worth it! Thanks for sharing such scrumious recipes!! love reading your blog!! Love,love,LOVE snicker doodles. They are fabulous dipped in a mug of hot chocolate! P.S. It warms my heart to know my fun lovin' relatives aren't the only ones to use inappropriate sentence enhancers over the pulpit at funerals (I'm surprised my hubby's Grandma didn't sit straight up in the casket over some of the tender thoughts that were shared at her funeral. I was afraid I would have to cover the baby's ears before it was over! I made these and my dough was super sticky. I'm not sure what I did wrong… I'm sure they will taste fabulous, all your recipes do. I wonder if I just creamed things too long or something. Any ideas? Sometimes if your butter is super soft, like to the point where some of is is a bit runny you can end up with sticky dough. The mixing shouldn't be the issue, unless you mixed it for like 10 minutes and the butter got to warm. Hope they turn out ok!!!!!! I was in Cedar City this past week. We had a lot of fun. Thanks for the parchmant paper tip. I do have some…I just always get worried that it will affect the taste, or texture of the cookie. But now that you suggest it, I will give it a try next time. Esspecially for sweet rolls. Cleaning the pans after making those can be a huge project. Thanks for the tip! Have a good one! Made these last night, they were fabulous! I have never made Snickerdoodles before, but hubby loves them so when you posted this I thought I would be a wonderful wife and make them 🙂 I must make my cookies bigger than the norm because I never seem to get as many cookies as the recipe says. Love the blog and look forward to checking it every day! 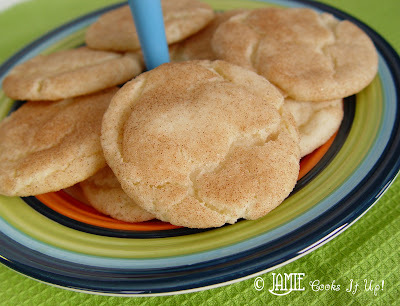 Snickerdoodles have always been a favorite of mine and I have many fond memories of eating these cookies. Yours look wonderfully crackly and sweet. Hey Jamie my 15 year old daughter found your blog the other day and first let me thank you for giving me something wonderful to do with my precious daughter, next let me say… Oh my goodness!!! Wonderful cookies, my daughter and I had the same problem as above writer (too sticky), but it was warm and so we popped them in the refrigerator for 10 minutes all was well. Thank you we look forward to doing more of your recipes in the future. These are great! Chewy, warm, and soft! Perfect!! I've been using the same snickerdoodle recipe for years, but it has veg. shortening in it. I wanted to get away from using trans fats in my cooking. So, I made it with all butter one time and they just weren't the same. Then I blog hopped here and found this recipe. I made them and they turned out great! The small changed in the measurement did the trick! Thanks for posting this recipe! 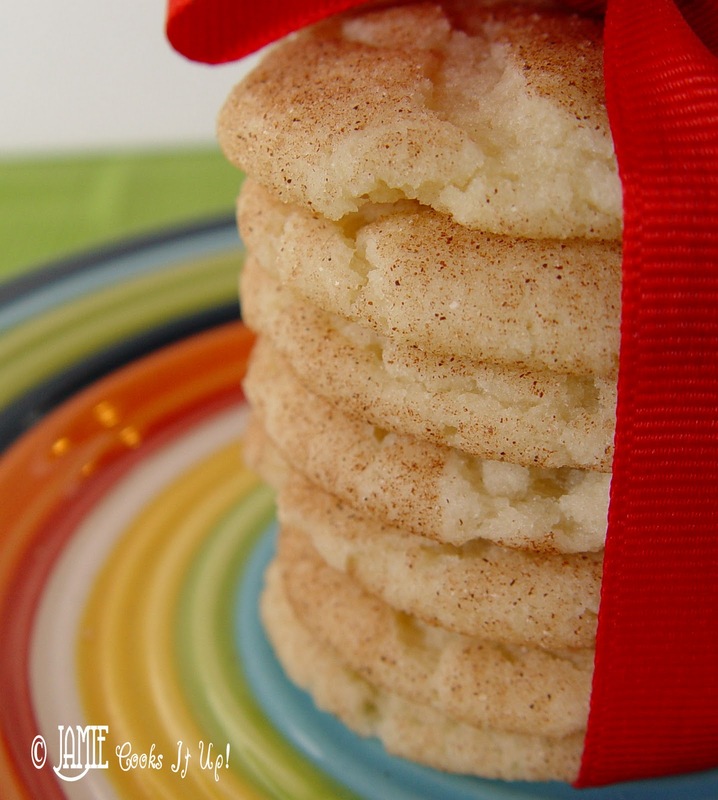 I think snickerdoodles will always be my favorite cookie! I do have a question. 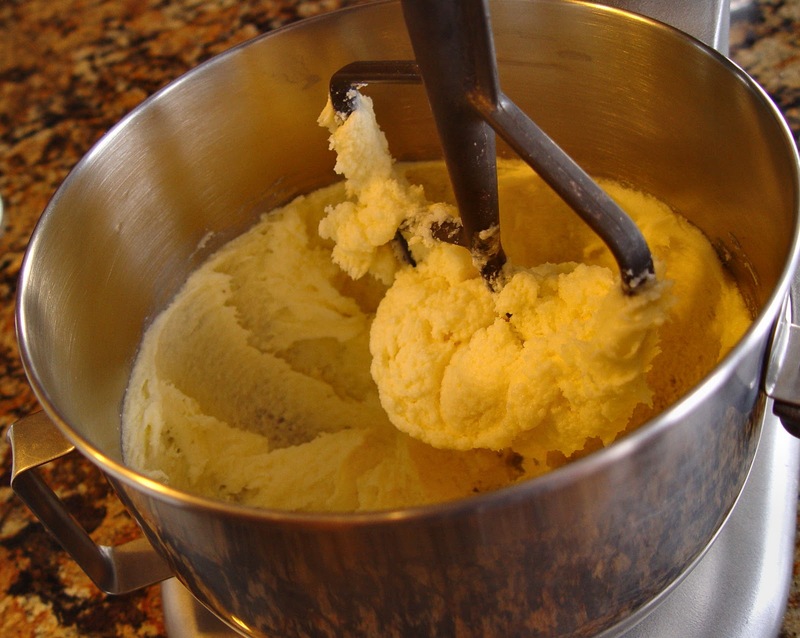 Do you use salted or unsalted butter in your recipes? Hey Jamie I love these cookies ! I was wondering how I can make them more flat. Mine seem to be more think and ball shaped. Thanks! Hello- I am in the midst of making your recipe. I use true butter and make sure all of my ingredients are room temperature. That may have made an effect on the recipe, but I had to add a bit more flour to the mixture in order to even form balls and not have the dough stick to my hands. I also added homemade vanilla (: After this the cookies came out AMAZING! Thanks for the recipe! Hi Jamie! Love all your recipes! Quick question, what size ice cream scoop or measuring spoon do you use to dip the dough out before you form the balls? I didn’t get as many cookies as the recipe said I would…only about 35. Thanks again!